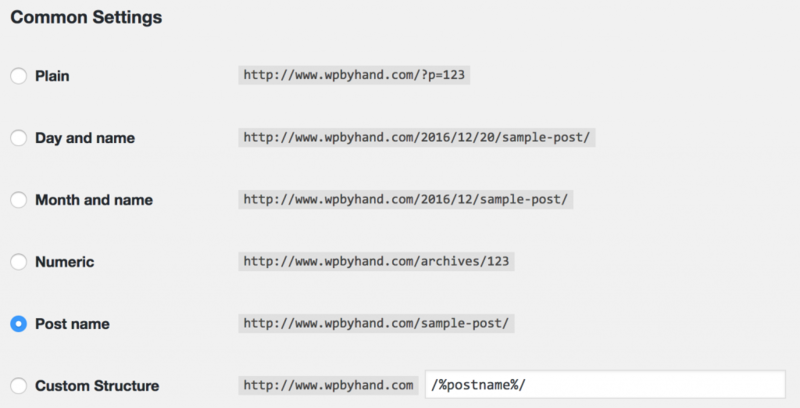 At WP By Hand, we recommend websites choose the correct WordPress permalinks for their website. In this blog post, we’ll discuss which WordPress permalink structure you should be using and how to make the change on the back end. Permalinks, permanent links, are the permanent URLs to your individual pages and blog posts, as well as your category and tag archives. For example, a permalink looks like this: http://www.domain.com/about-us. The About Us part in the domain name is the permalink. A clean structured domain with permalinks helps with a businesses search engine optimization (SEO). The easier the URL is to read for humans and search engines. The better chance your website will rank on the search results page. We will not dive deep into SEO, but feel free to read an excellent post on WordPress SEO. In short, using permalinks for a website is a must! What Type Of Permalinks Should You Use? There are a variety of WordPress permalinks to choose from. For instance, a news website should use the permalinks that include the dates. This particular permalink is called day and name. News sites are publishing stories on a daily basis. Having the date for news articles is helpful for current events. Another example of a permalink is the post name. This particular permalink should be used for brochure and eCommerce websites. We will take the concept a step further. Due to eCommerce websites that sell products, having the post name option is optimal. The post name provides a clean URL structure similar to the example we provided in the first paragraph. The product page has a better chance of ranking well in the search results with a clean URL. Head over to the Settings – Permalinks section in order to change the structure. You will choose which WordPress permalink setting is right for you website. Once you decide on the setting, scroll down to the bottom and click on Save Settings. A word to the wise. If your website has been live for awhile and you are looking to update the permalinks. Be sure to redirect the old permalinks to the new permalinks. Here is a helpful redirect tool from the folks over at Yoast SEO. The redirect tool will allow you to place all of the redirects in the .htaccess file. The .htaccess file may be hidden within your root directory. For instance, you will need to contact your web hosting provider or show hidden files in your FTP client if the file is not present. Once you have finished all of the redirects. Head over to the .htaccess file, open with a text editor, and begin to add the redirects. If the redirects don’t appear to be working, contact the web host provider for more assistance.